Light weight and compact 2000 watt inverter installed in the small compartment which is just forward of the propane bottle compartment on the curbside where we normally install two batteries. 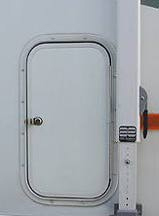 The inverter is shown in the right hand photo, installed in the compartment with the access door open. There is a 300 amp 12v. fuse installed next to the inverter on the left, in the main battery line. 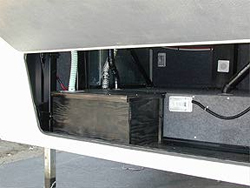 The battery boxes for the inverter system located just inside the front storage access door. They do not interfere with basement storage. The question of the day: Do you really want or need a gasoline or propane auxiliary power generator? An INVERTER may be a better answer for you. Inverters are space age "little black boxes" (no moving parts) that transform storage battery 12v. power back into home type electricity (110v. ac). Not only is an inverter quieter and more efficient than a generator, you get to leave 275 pounds of metal, fuel, and fumes behind, picking up some very dear storage space in the process. Rather than investing in a costly little machine that requires continual maintenance, fuel, and goes putt . .putt . . putt, you may be happier being able to store electricity in a battery and then use it to run 110v. hair dryers, microwaves, computers, or big TVs with VCRs. roof airs is that we would have to add batteries weighing an additional 600 pounds. Many of our western states area customers have found that the 12v. attic fan (a.k.a. Fantastic Fan or Fantastic Vent), which moves approximately 900 cubic feet of air per minute, can create a breeze running through the coach that, according to our customers, is often more comfortable in high temperatures than closing all the windows and doors and running the roof air. Remember an RV roof air conditioner only cools 20 to 25 degrees below the ambient temperature. In other words: if it is 100° outside the roof-air will generally only cool the air down to about 80°. All this discussion is a wonderful justification for not having a roof air and only an attic fan, except if you are in Florida. In Florida and similar high humidity parts of the country, you have to have a roof air. . . . Maybe two or even three!!!! Here you can see the battery box with the sealed and vented cover removed. So . . . lets get back to the inverter. 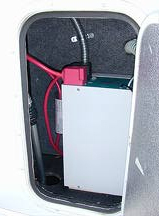 An installed inverter, complete with a remote inside control monitor and two extra golf cart batteries, costs about the same as a small installed RV generator. Long term, this means that there is very little added weight, operating cost, and maintenance cost, and inverters are totally non polluting. They don¹t pollute the air, the water, or your ears! A 2000 watt inverter will run two circuits with their own automatic connection relays. At the request of the inverter manufacturer, a 10 amp line is connected to the GFI (ground fault interrupter) circuit and a 15 amp line is connected to the micro wave circuit. Ask us for a current quote for an inverter installation, if you are thinking about "dry camping" with out the necessity of an auxiliary power generator. Here's what our customers have come up with over the years that seems to make the most sense for fifthwheels such as the Americana. Set a quality 5000 watt (don't need one this big except it will work well on hot days, at high altitudes, and when it gets a little old and tired like the rest of us) portable generator just forward of the fifthwheel hitch in the bed of the pickup. This space is difficult to use, and so is often wasted anyway. The weight of the generator placed forward of the hitch produces a slight forward weight bias which we welcome, and this way the generator is not tying up valuable fifthwheel storage space. emergencies (talk to all the recent flood, hurricane, or earthquake victims). 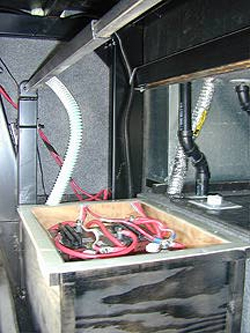 The new quality generators are quiet, fuel efficient, and best of all, cost about $1000.00 less than permanently installed RV generators, which are priced higher because they have a relatively low production volume and need a special and expensive cooling shroud. The inside wall mounted control panel is not the only on/off switch.